Arriving from the cold of winter to this perfect oasis was exactly what our family needed. The view, the access to the ocean/pool and convenience of restaurants, retail made it all so easy. The condo (Chac Hal Al C202) was nicely appointed and comfortable (especially the beds). Best sunsets off the upstairs balcony. Absolutely awesome place. Condo (Villas del Mar II #108) was perfect. People here extremely friendly. The view outstanding. The restaurants were great! Andrew our liaison had everything arranged. Perfect vacation! Our visit at Casa de Amigos was perfect from start to the end. The transfer company arranged by Andrew was just great. He helped unload all of our luggage and groceries and brought them all to the room. The large 2 bedroom condo was absolutely beautiful. The décor very tasteful. The kitchen had everything one would need from a juicer to wine cooler. The fridge was top notch and kept everything chilled. The views from both sides were fantastic. The 2nd bedroom overlooked the pool area that was beautiful night and day. The living room and master bedroom had an amazing view of ocean that was close enough to hear. And that was a great surprise as we didn't think we would be that close. We left the air off most of the time and just let the breeze run through. Having a window in the kitchen made it great for that. The cleaning staff did a wonderful job when then came as well, leaving the condo so clean. The condo is stocked with everything one would need if you wanted to never leave. The grill on deck was new and the oven would also be nice if one wanted to use. We are on vacation, so eating out most of the time. But did use items to make snacks during the day and they glassware the condo supplied had glasses for any drink you would want to have. The other tenants were also very friendly and helpful when we asked advise or had questions. Andrew did a fantastic job lining up both our transfers and golf cart and that was nice to have taken care of. He also was great at responding to any questions prior to arrival. Can't wait till next year. I loved my 2 week stay at this condo (Chac Hal Al C202). Location can't be beat, but for me the high point was the view, especially from the master bedroom. Each night I slept with the sliders open, listening to the waves. No a/c needed, great ocean breezes and sunset views. The property is well maintained and includes all you need for a carefree vacation. Great pools, beach, and friendly people. Just a quick stroll to restaurants and services, and a 7 minute walk outside the complex to the Colectivo's to take you up or down the coast. Kudos to Andrew for answering my many questions and providing most excellent customer service. This is a great value, and I hope to return. We had such a great time on our vacation. We loved the condo (Villas del Mar II #108). It had everything we wanted and the teens were happy too! Beautifully decorated and comfortable. Beds were lovely. The walk in showers were much appreciated by grandma. Andrew was very helpful in answering any questions we had. We will definitely be back. We stayed in this area for the first time. Loved that we could walk the beach quite far, swim with zero waves, walk to numerous awesome restaurants, and take inexpensive buses around the surrounding area. This 2 bedroom/bath condo (Chac Hal Al C202) was great for a couple. We enjoyed the quietness, location, grounds, pool. but most of all the views from the balcony. The kitchen was fully equipped, washer & dryer, bed was comfy. The security was very good, always around, very safe area though. We will for sure book again, Booked through Sol Maya Rentals. Only negative for some would be no dishwasher, and 30 steps to the condo, no elevators. We like to do dishes, and stairs were great for exercise lol!!! The reason we picked this condo out of others we saw online, was for the full-wall sliding windows (La Buena Vida - E201). When we first walked in after a long flight, we immediately opened the entire wall up to the outside, and listened to the beautiful sounds of the birds and the ocean. We never closed them the entire week (we aren't air conditioning type people, even though the AC worked just fine). The condo was perfect for our family of five. Easy to get to the beach (which incidentally, is by far the BEST beach in all of Puerta Adventurous). We felt extremely safe in the quiet, gated community. The charming little village across the street was great for morning coffee/pastries, and dinners. Our teenagers enjoyed karoke one night at the open bar. All in all, this was probably one of our favorite vacations. We couldn't have asked for more! Stayed at this unit (Casa Angelica - Quinta del Sol 417) in the spring of 2016 with wife and kid. Condo went through a recent upgrade and refurbishment and felt brand new and high-end. The kitchen is large and fully equpiped, the bedrooms are comfortable and sizeable. The bathrooms are modern and clean. The terrace has a comfortable sitting area, a BBQ and sun chairs. It is very large and we spent most of our vacation time on it, or in the two swimming pools and on the beach. The common area with the pools can be reached through one of two elevators only steps away from the condo. One of the two pools is right next to the beach. The town is a 5 min walk away and can be reached either through a walk on beach, or via the road. Within a 20min drive are various great vacation destinations including: Tulum, Playa del Carmen, Xel Ha, Xcaret, fresh water holes ("cenotes"), etc. Overall a great setting and very relaxing. Property and amenities are accurately described in previous reviews and the overview - clean, comfortable, functional with fantastic views (Chac Hal Al C202). Property manager, Andrew was great and welcoming, responded to all requests immediately. We travel with three young kids. They slept comfortably downstairs, with the youngest in a porto- crib kindly provided (long with a highchair) by the property manager. We (parents) appreciated an opportunity to retreat upstairs into a beautiful suit with a huge balcony from which we could enjoy a panoramic view of the nights sky. There are plenty of towels, sheets, as well as dishes and various kitchen equipment including coffee maker, kettle, and even a juicer that we used a couple of time to juice delicious citrus from the local supermarket. A grill at the balcony was also great. A washer and dryer were a great help with all kids' laundry. Although we spent most of days driving to different beaches and other site between Puerto Aventuras and Tulum , we spent a couple of afternoons at the condo beach and pool. Kids loved playing in the pool, and exploring sea creature in tidal pools an the rocks in front of the condo. I also took older kids snorkeling a just beyond the rock barriers at the condo beach. Restaurants and small shops are just outside of the condo - around the dolphin discovery park - which meant convenient and easy mealtimes with kids. There is also a fantastic supermarket off the highway near the entrance to Puerto Aventuras. My main tip - rent a car and explore what Riviera Maya has to offer. Right outside of Puerto Aventuras there is a wonderful and uncrowded cenote Ponderosa de Eden as well as a wild & fun Xpu-ha beach. Tulum beach is absolutely incredible, it was a highlight of our trip. We came down for a wedding and needed a place to stay in Puerto Adventures. This condo (Villa Ixchel, Villas del Mar II #108) is right on the beach, with a pool large enough to actually do lap swimming down the center. The ocean is a little rough with coral, but if you just walk down the beach (beach is sandy) a very short way, it is a nice sandy entrance. The house is fully equipped with everything you might need, to cook, towels for the beach, TV's in every room, plenty of bathrooms options and included drinking water. We had a few little problems of our own doing and Andrew was Very prompt to help us out with them, he actually came over and returned emails promptly. He suggested we snorkel the reef right there and it was a great tip. He also told us about the farmers market and how to purchase fresh fish. If your looking for a place to accommodate your family and or couples you won't be disappointed. Great ground floor with a wonderful view. We were all very happy with it and others who attended the wedding were jealous of our accommodations. Thank you for a wonderful week! I said in my review that our friends, who were staying at the Hard Rock Riviera Maya, were jealous of our condo -- and they were! Other friends, whose parents have a condo at Xa Ha lal on the other side of the Omni, said they liked our condo better than theirs in Xa Ha Lal! Thank you for everything during the week, including recommending Tina and your help with the fishing charter (which never happened due to the unnaturally rough seas). You are truly a wonderful host and we hope to return soon to visit! We had a very relaxing stay at Chac Hal Al C202. We do not travel often and everything exceeded our expectations. We loved the condo and are already considering going down again without kids and would request the same condo. The view and location were fabulous! We stayed at Villa Del Mar (E201) with another couple for a week and had a fabulous time. The Condo was spacious, very well appointed and centrally located close to all the attractions that the Riviera Maya has to offer. We had a beautiful view of the Caribbean from the unit and the beach and pool areas were first class. 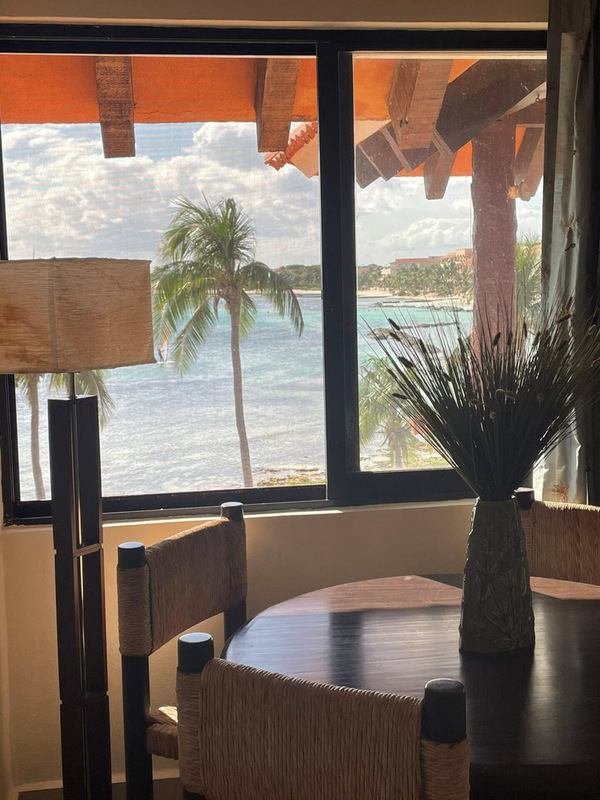 Villa Del Mar is located in the gated community of Puerto Aventuras and it's downtown area, which has restaurants, shops and bars is a two minute walk from the unit. We were very pleased with the way that Andrew took care of us during our stay and look forward to returning soon. We had an awesome time in Casa Angelica! The apartment itself was amazing; the owners did a really good job decorating it and making it very comfy and well stocked. We truly felt like at home in this place, very welcomed. Everything is clean, inside and outside the condo. You have everything you need; from an industrial unit of purified water to chairs at the beach. Conveniently located this condo is made for both; the ones that like to be active and explore adventurous places (like my two big kids and their Dad) to those of us that like the quiet and calm/lazy vacation. We want to come back next year for sure. I'm so happy we found this hidden treasure! This is our first apartment rental in Riviera Maya and I could say that from now "no more hotel rooms"! The pictures on the internet does not make justice. The apartment is huge and with good decoration. Everything you need is in the house and just 15 mts. from the beach. We stayed in August and apparently was low season, nobody has to fight for loungers and the pool was only for us most of the time. Location of Puerto Aventuras is pretty good, is just 20 mins from Playa del Carmen and to the south there are a lot of beautiful beaches. If you are looking for something to relax, this is the place, but if you are looking for "beach parties", may be this is not for you. Andrew the manager was very helpful and pending for any assistance. The views of the ocean are unbelievable from this unit and the outdoor terrace was perfect. You can't go wrong with Sol Maya Rentals. Andrew's management of this property was very much appreciated. Villa Del Mar is a condo complex with ocean views that do not disappoint and the complex grounds are so well maintained. Sol Maya was the icing on the cake. Our previous accommodations in a different location didn't work out so we came back to Puerto aventuras without a reservation for a week. Sol Maya's website had a cell number so we called on a Sunday. He got us in a condo that was available for the week. Providing, fresh towels, linens, bottled water, cloths detergent, dish washer soap, paper towels, sponges and all of the items you need to start up a week in a condo. May seem like small issues but it is really nice that the house keeping supplies we covered. Responsive and professional. - Thank you for saving our week. It has only been a few weeks since we got back but we're already missing our newly discovered best vacation place ever! This holiday had a good feel to it right from the start with our dealings with andrew of Sol Maya Vacation Rentals. His openness and generosity with information and assistance paved the way to a truly wonderful vacation in Puerto Aventuras and all that it had to offer with great beaches, great attractions, and equally great distractions! We have to also give special mention to our condo and the staff at Villa Del Mar which were equally as pleasing. What we particularly liked was that through the close to 2 weeks that we stayed there, we were able to accomplish all that we wanted to do on foot and never found ourselves wanton for anything that needed a car - aside from getting caught in a rainstorm once after having dined out! The people, the dolphins, the restaurants and bars, and more than anything else, the sense of safety that we had all led to a very memorable vacation. Unquestionably, a great place to stay! - Thank you Andrew and Sol Maya Vacations. You will remain on our contact list for years to come! I just wanted to say a big THANK YOU for all your help in making our vacation so much fun. We totally loved the Playa Caribe and had so much fun staying in condo 5. The views were indeed breath taking just like you said they would be. You helped me plan one of my best vacations yet. Thank you so much for that. The apartment was really the best, very nice and my family like it very much as well as the beach. I did not have the opportunity to meet you, but I would like to thank the attention. They were spectacular vacations. The location was great, the condo was nice and clean, all in all we had a great time (except for the rainy day!). This is our third time booking a vacation with Sol Maya, and as usual, we have been very pleased with your service, your responsiveness, your travel advice. We will certainly be back in the area and will be in touch. Our family had the pleasure of enjoying a months vacation at Villa del Mar in Puerto aventuras this past February. It is a found paradise for us and we certainly will return. Pictures cannot do justice to this beautiful, clean,and security gated complex. Andrew Leigh of Sol Maya Rentals proficiently looked after all details and made us feel welcome. We highly recommend andrew as a trusted professional with no surprises. Our condo unit home was Casa Pesca Unit E201 and it is well laid out and equipped. The E building has an elevator for your convenience. The rooms are all large with comfortable beds, and a spacious balcony for outdoor living with sliders open 24/7. The grocery service provided by Sol Maya is well worth it and the kitchen was stocked upon our arrival. We are hooked on Villa del Mar for the stunning visuals, abundance of mature palm trees, manicured surroundings, two free form pools with added features, white sand beach and sparkling blue Caribbean Sea so just sit under a palapa or sun umbrella, relax or rent a kayak on the property. Puerto Aventuras is a safe 600 acre gem with check point security. The unique shops, delicious restaurants and cafes, varied nightly entertainment, local market for fresh fruits and vegetables, huge marina with catch of the day, catamaran rides, swim with dolphins, etc. make it a fun place for all ages. Many locals use golf carts and bicycles to get around which adds to the atmosphere. Villa del Mar is situated just steps from these activities. Have no concerns Andrew has the expertise so just book your holiday and experience the adventure and bliss for yourself. This condo (Oceana) was perfect for our needs. The layout was exactly what we needed for two families. The larger family used the 2 bed/2 bath on one side and our family used the the other bedroom/bath. Water pressure was great and the dishwasher wash a big plus! The ability to slide open all of the oceanside doors was an amazing feeling, especially in the morning with the sun shining in. When we were in the kitchen we never felt like we were working, only a few more steps away from the beach. The pool and showers were great, as was the distance of Villas del Mar II from the Omni and fresh market on Wednesdays and Saturdays. Now that we have been on the ground floor, we can't go back. Thanks to Andrew from Sol Maya for the grocery service and attentiveness! We spent 7 nights at the property (Ixchel); my wife and I, and 3 of our sons, ages 15, 17, and 20. We had a fabulous time. Everything met or exceeded our expectations. Great unit, right on the beach! grill, outdoor dining, kayaks, lovely town within easy walking distance. And all in a very safe, gated community. Andrew, the property manager could not have been more helpful. - Looking forward to our next visit! We had a spotless, beautiful suite that overlooked 2 pools and the ocean. It was peaceful and away from the crowds. You could walk to the little local van "Collective" and ride with the locals for about 25 pesos. There were lots of activities within reach (bring your tennis racket if you want to play tennis though). We were met at the airport promptly and taken to our suite. Our fridge was stocked. Our kids, ages 13-23 had a blast and it always a treat to come home to our lovely condo. - Thanks for the great vacation! We love Casa Pesca! I am sorry I did not get to tell you good-bye or express my appreciation for ALL that you did for us while at the Villas del Mar. It was a dream come true and far exceeded all of our expectations! All of your suggestions and arrangements for us were superb! - Happy New Year to you and Lisa. Our vacation began the day we decided to email andrew of Sol Maya Rentals. Andrew was always quick to respond with emails, suggestions/advice throughout our planning process! We arrived to Unit 108 (Villas del Mar II) in the evening around 6:30pm, we were unsure where to go initially(cab driver was unclear and we may have had a few too many margarita's prior to arrival...ha!) Andrew had no problem in us arriving outside his home and giving our cab driver directions! We arrived after quite a long travel day and was dark when we arrived. Andrew had gone to the grocery store and picked up a few items we had requested prior to our arrival and of course had our beer/wine nicely chilling on arrival, which was a great service to add after a long travel day! When we woke in the morning it was kinda like Christmas morning, all our hard work of planning for months had come down to this very moment before us was beautiful sunny blue skies the turquoise ocean wrapped nicely with a blanket of soft white sand right out side our window and the pool just steps from our patio! We were in heaven and so were our children aged 7&9, as soon as they saw the pool they were in and hooked for our entire stay! The condo was bright, breezy, clean and larger than we had suspected each bedroom had its own washroom/shower or bath tub! Our family of 8 had no problem of space and no one was on each others toes. Our family loved the huge sliding glass doors that lead you to your outdoor living room/dining room it was nice and shady if you wanted to escape the sun or just sit around for hours and chat!Right off your patio is a great grassy area (kids loved having more space to use but still within eye shot). At the time we visited there were more than enough loungers to use. Andrew was available even after we arrived for questions. Cabs are easy to catch to go to other locations for tours or beaches. There is even a great kite surfing beach 10 mins from the condo as well. - Thanks for making this a stress free holiday. We stayed in this unit the week of Thanksgiving 2012. The unit (Villas del Mar E201) is great. It has a nice open plan, the kitchen is big, the rooms are very comfortable. The best part is that you are right next to the town square, but you don't hear the noise. The beach is perfect, good swimming and they have an area for smaller kids so we didn't need to be worried about them when they were in the water. No crowds!! That was the best part. Some days we were the only people in the beach. That was great. The pool is nice too, it is not heated so it can get cold but you get used to it. The unit has a grill so we grilled pretty much everyday. Overall it was a nice relaxing vacation. Our kids loved it and I loved it too. I have to admit I am sad to be home...the visit to Akumal was absolutely amazing! And the condo was exactly what I had envisioned and hoped for! What a spectacular location at the point by the Yalku Lagoon - I absolutely loved opening the balcony door and listening to the sound of the waves at night. Claudia, Cristina, Humberto and Miguel were extremely friendly and helpful in everything they did for us. I just want to say Thank You for your great recommendation on Playa Caribe!!! We had a great trip and LOVED the condo!!!! I will be passing your name along to friends traveling to the area. Thanks Again! Andrew and his Staff, are awesome, they make everything so you can have a wonderful vacation. The property (Villa Ixchel) is just steps from the beach, and the pool. It has a grill outside so making a barbeque just in front of the sea is wonderful. I highly recommend it for families with young children. They even help us with a crib for the baby. The outside Jacuzzi is a must. E201 at Villas del Mar was a perfect place for my wife, two girls (9 and 6) and I. The unit was immaculately clean, very spacious and had all of the comforts of home. The view from the unit was perfect, overlooking one of two huge pools. You could also clearly see the ocean. My favorite part were the patio doors that opened up completely to the outdoors, the gas grill and the washer/dryer. Beyond the unit itself, the pools were the largest in Puerto and perfect for the kids. At no time did we have problems finding lounges or tables/shade umbrellas. Also, the beach is the best in Puerto. there isn't anywhere else on the beach that had a larger beach with sugary white sand. Lastly, I have to say that Andrew Leigh at Sol Maya Rentals was phenomenal. He had a welcome food basket when we arrived (salsa, chips, avocado, jalapenos). No detail went unnoticed and he was very professional. I'd highly recommend him for a stay in Puerto or the surrounding areas. He lives there, so knows the area better than anyone. We really liked Akumal and La Bahia. We loved walking into town, and enjoyed the restaurants we tried. We especially liked the lunch counter by the grocery store. We took a day trip to Coba, which we really enjoyed. We made a shorter excursion to Tulum - also good. We really enjoyed snorkeling in Half Moon Bay and at the Akumal Bay beach. My husband and son went scuba diving and had a good experience (Akumal Dive Shop, I think - the one by the ecological center). The condo fit our needs well. The views were fantastic, it is well appointed. The mattresses were very comfy! Really, a great time all around, a nice place to hang out on the beach. Other guests were friendly. Staff very friendly and helpful as well. Quiet, but stuff to go do...a good week! Villas Del Mar I is a great place to stay if you want to enjoy a relaxing beach getaway. The complex is quiet and very well kept. Plentiful places to walk and run! Andrew was a great host. Appreciated all his shopping and advice. A great vacation! We had a wonderful time in Puerto Adventuras, wish we could have stayed longer...! Chac Hal Al was awesome, the Studio was perfectly located and just equipped with all our needs! Especially George (Security Guard) made our stay, -what a great "hombre", -give him our regards! We will be back for sure! - Thank you for everything Andrew & will be back!! It was a great trip, everything was perfect. Thanks again and hopefully we can talk about the next trip for the first week in August 2012. We had a great time at Xaman Ha! Thanks for all of your assistance. We at Sol Maya Vacation Rentals pride ourselves on our level of customer service and the quality of the properties listed on our website. Featured here are comments and property reviews from our customers. For those interested, please read here about how safe Mexico is for travel and vacationing.